We’ve had Git hosting support in Launchpad for a few years now. One thing that some users asked for, particularly larger users such as the Ubuntu kernel team, was the ability to set up per-branch push permissions for their repositories. Today we rolled out the last piece of this work. Launchpad’s default behaviour is that repository owners may push anything to their own repositories, including creating new branches, force-pushing (rewriting history), and deleting branches, while nobody else may push anything. 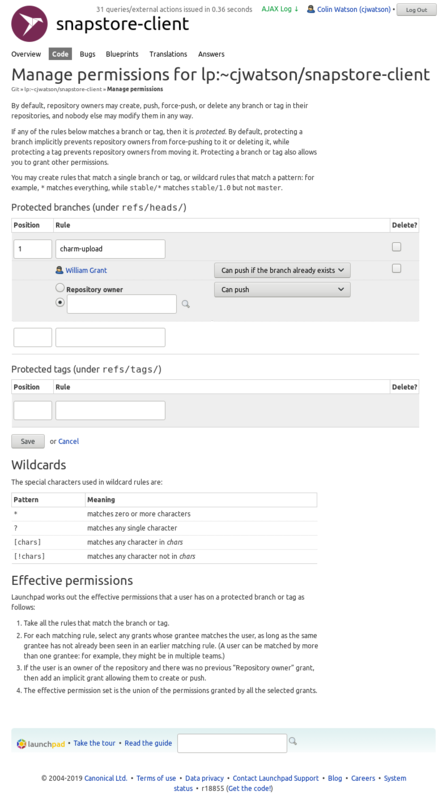 Repository owners can now also choose to protect branches or tags, either individually or using wildcard rules. If a branch is protected, then by default repository owners can only create or push it but cannot force-push or delete; if a tag is protected, then by default repository owners can create it but cannot move or delete it. You can also allow selected contributors to push to protected branches or tags, so if you’re collaborating with somebody on a branch and just want to be able to quickly pair-program via git push, or you want a merge robot to be able to land merge proposals in your repository without having to add it to the team that owns the repository and thus give it privileges it doesn’t need, then this feature may be for you. Launchpad has had Git-to-Bazaar code imports since 2009, along with imports from a few other systems. These form part of Launchpad’s original mission to keep track of free software, regardless of where it’s hosted. They’re also very useful for automatically building other artifacts, such as source package recipes or snap packages, from code hosted elsewhere. Unfortunately they’re quite complicated: they need to be able to do a full round-trip conversion of every revision from the other version control system, which has made it difficult to add support for Git features such as signed commits or submodules. Once one of these features is present anywhere in the history of a branch, importing it to Bazaar becomes impossible. This has been a headache for many users. We can do better nowadays. As of last year, we have direct Git hosting support in Launchpad, and we can already build snaps and recipes straight from Git, so we can fulfil our basic goal more robustly now with a lot less code. So, Launchpad now supports Git-to-Git code imports, also known as Git mirroring. You can use this to replace many uses of Git-to-Bazaar imports (note that there’s no translations integration yet, and of course you won’t be able to branch the resulting import using bzr). See our Git documentation for more details. This is the same form used for Launchpad bug references in debian/changelog files in source packages, and the general approach of mentioning bugs in commit messages is similar to that of various other hosting sites. Bugs are not automatically closed when merge proposals land, because the policy for when that should happen varies from project to project: for example, projects often only close bugs when they make releases, or when their code is deployed to production sites. Users familiar with Bazaar on Launchpad should note that the model for Git bug linking is slightly different: bugs are linked to merge proposals rather than to individual branches. This difference is mainly because individual branches within a Git repository are often much more ephemeral than Bazaar branches. Documentation is here, along with other details of Launchpad’s Git hosting. If you are a member of Launchpad’s beta testers team, you can now try out Git-based recipes. These work very similarly to the Bazaar-based recipes that Launchpad has supported for a long time, with a few minor changes to handle differences in the underlying version control system: the main thing you’ll probably notice is that you almost always need to explicitly specify a branch name. The recipes documentation explains what to do; if you’re already familiar with how recipes work for Bazaar, then you should probably skip straight to the recipes guide to look over the differences for Git. Please try this out and report any bugs you find. If all goes well, we’ll open this up to all users in a couple of weeks. Update: as of 2016-03-15, this feature is enabled for all Launchpad users. If you are a member of Launchpad’s beta testers team, you can now try out webhooks for Bazaar branches and Git repositories. These can be used to set up integration with external sites for various purposes, such as running CI jobs or publishing documentation. We expect to open this up to all Launchpad users soon, but in the meantime please do file a bug against Launchpad itself if you encounter any problems. See our webhooks documentation for more details. Update: as of 2015-11-20, this feature is enabled for all Launchpad users. It’s been a while since we posted much regularly on this team blog, not least because for a while Launchpad was running more or less in maintenance mode. That’s no longer the case and we’re back to the point where we can do feature development work again, as exemplified by our recent addition of Git code hosting support. Lots of other things have been happening in the Launchpad world lately, though, and the half-way point in the year seems like a good time to start talking about them. I’m going to try to do this a bit more regularly, aiming for about once a month when we also update our internal stakeholders. This post covers roughly the last three months. Today we’re announcing early support for hosting Git repositories directly on Launchpad, as well as or instead of Bazaar branches. This has been by far the single most commonly requested feature from Launchpad code hosting for a long time; we’ve been working hard on it for several months now, and we’re very happy to be able to release it for general use. This is distinct from the facility to import code from Git (and some other systems) into Bazaar that Launchpad has included for many years. Code imports are useful to aggregate information from all over the free software ecosystem in a unified way, which has always been one of the primary goals of Launchpad, and in the future we may add the facility to import code into Git as well. However, what we’re releasing today is native support: you can use git push to upload code to Launchpad, and your users and collaborators can use git clone to download it, in the same kind of way that you can with any Git server. Our support is still in its early stages, and we still have several features to add to bring it up to parity with Bazaar hosting in Launchpad, as well as generally making it easier and more pleasant to use. We’ve released it before it’s completely polished because many people are clamouring to be able to use it and we’re ready to let you all do so. From here on in, we’ll be adding features, applying polish, and fixing bugs using Launchpad’s normal iterative deployment process: changes will be rolled out to production once they’re ready, so you’ll see the UI gradually improving over time. What will be supported later? Launchpad’s Bazaar support has grown many features over the years, and it will take some time to bring our Git support up to full parity with it and beyond. Git repositories use a somewhat different model from Bazaar branches, which we’ve had to account for in many places, and some facilities will require complete reimplementation before we can support them with Git. See our help page for more known issues and instructions on using Launchpad with Git. This is a new service, and we welcome your feedback: you can ask questions in #launchpad on freenode IRC, on our launchpad-users mailing list, or on Launchpad Answers, and if you find a bug then please tell us about that too. Launchpad is free software, licensed under the GNU AGPLv3. We’d be very happy to mentor people who want to help out with parts of this service, or to build things on top of it using our published API. Some preliminary documentation on this is on our developer wiki, and you can always contact us for help. On the 5th of October we’ll be ending our beta of Mercurial imports in Launchpad. On that day your existing Mercurial imports will cease and you won’t be able to create new ones. This doesn’t affect Bazaar, Git, Subversion or CVS imports. You’re probably wondering why. During the beta, we found that not many people wanted to import Mercurial branches into Launchpad. Today there are only around forty people using the facility. It’s also fair to say that our importer wasn’t of the quality we want for Launchpad. So, with low demand for the feature we decided to focus engineering effort elsewhere rather than continue to maintain, or fix up, a less than satisfactory feature. I’m sorry if you currently rely on Launchpad to import code from Mercurial into Bazaar. You can, though, still use the bzr-hg plugin locally. We are reimagining the nature of privacy in Launchpad. The goal of the disclosure feature is to introduce true private projects, and we are reconciling the contradictory implementations of privacy in bugs and branches. We are implementing three kinds of policies, proprietary, embargoed security, and user data. The maintainer is the default member of these policies. The maintainer can share a kind or private data by adding a user or team to a policy. For proprietary projects, the maintainer can add their organisational teams to the proprietary policy to share all the project information with the team members. For Ubuntu, the maintainer will set the apport bot to be the only user in the user data policy; user data is only shared with a bot that removes personal data so that the bug can be made public. The Ubuntu security team will be the only users in the security policy. Most maintainers will want to add project drivers to the policies if they use drivers. Bug supervisors can be added as well, though the team must be exclusive (moderated or restricted). You can still subscribe a user or team to a private bug or branch and Launchpad will also permit the user to access it without sharing everything with the user. The existing behaviour will continue to work but it will be an exception to the normal rules. Polices replace the bug-subscription-on-privacy-change rules. If you have every had to change the bug supervisor for a project with many private bugs, you can rejoice. You will not need to manually update the subscriptions to the private bugs to do what Launchpad implied would happen. Subscriptions are just about notification. You will not be notified of proprietary changes is proprietary information is not shared with you. Sharing kinds or information via policy means that many existing private bugs without subscribers will finally be visible to project members who can fix the issue. We are adding a new kind of privacy called “Proprietary” which will work differently than the current forms of privacy. The information in proprietary data is not shared between projects. The conversations, client, customer, partner, company, and organisation data are held in confidence. proprietary information is unlikely to every be made public. Many projects currently have private bugs and branches because they contain proprietary information. We expect to change these bugs from generic private to proprietary. We know that private bugs and branches that belong to projects that have only a proprietary license are intended to be proprietary. We will not change bugs that are public, described as security, or are shared with another project. This point is a subtle change from what I have spoken and written previously. We are not changing the current forms of privacy. We do not assume that all private things are proprietary. We are adding a new kind of privacy that cannot be shared with other projects to ensure the information is not disclosed. Projects with commercial subscriptions will get the “proprietary” classification. Project contributors will be able to classify their bugs and branches as proprietary. The maintainers will be able to enable default proprietary bugs and branches. Next part: Launchpad will use policies instead of roles to govern who has access to a kind of privacy. Launchpad Blog by Canonical Ltd is licensed under a Creative Commons Attribution 2.0 UK: England & Wales License.